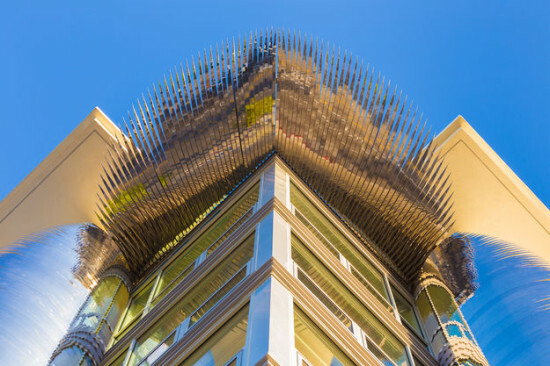 Working closely with engineers Buro Happold, Ball-Nogues designed Corner Glory, a fan of mirror-polished stainless steel spikes arranged around a column of inset windows. “We looked at ways in which we could create…something that suggested aura or an energy field, or a solar flare,” said Ball. 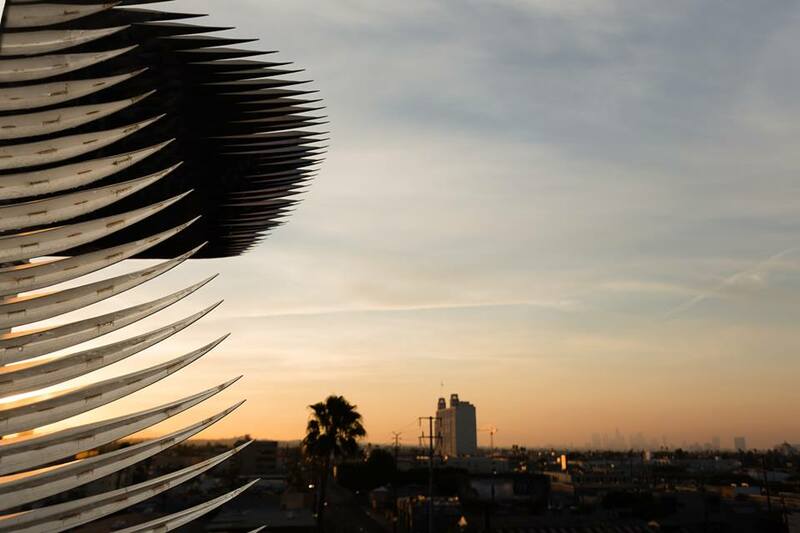 The reflective surface, its individual components lined up as the teeth of a comb, gradually dematerializes as it projects out from the building. “It doesn’t have a strong edge in spite of being a solid material,” explained Ball. 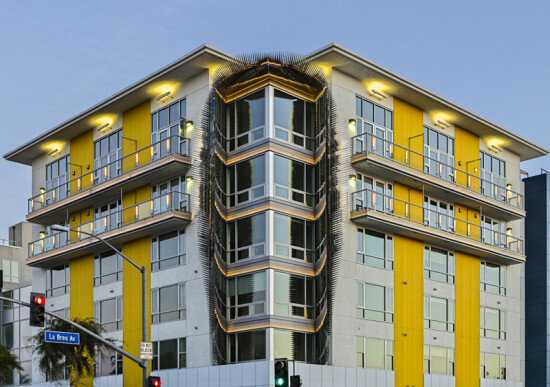 Corner Glory, which was both fabricated and installed by Ball-Nogues Studio, is fully integrated with the structure of the building. The Dylan, developed by Monarch Builders and Essex Property Trust, is joined by a second Monarch-Essex development at Fountain and La Brea called The Huxley. (The buildings were named for writers Dylan Thomas and Aldous Huxley, respectively.) 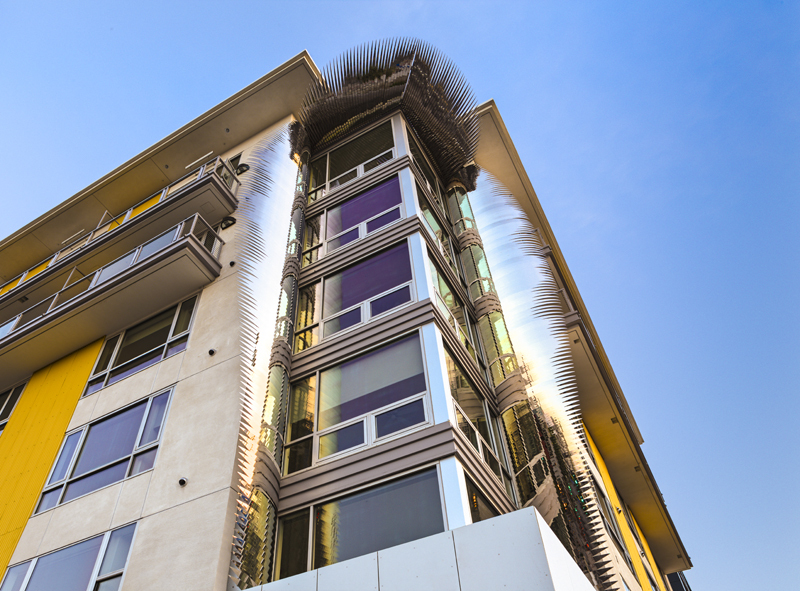 Newman Garrison + Partners designed both six-story buildings, which together cost more than $150 million. The Huxley, which has 187 units, opened March 15. The Dylan, with 184 units, is expected to open this summer.